As the city of Gerasa thrived and expanded there was a greater need for a substantial and continuous water source within the city. 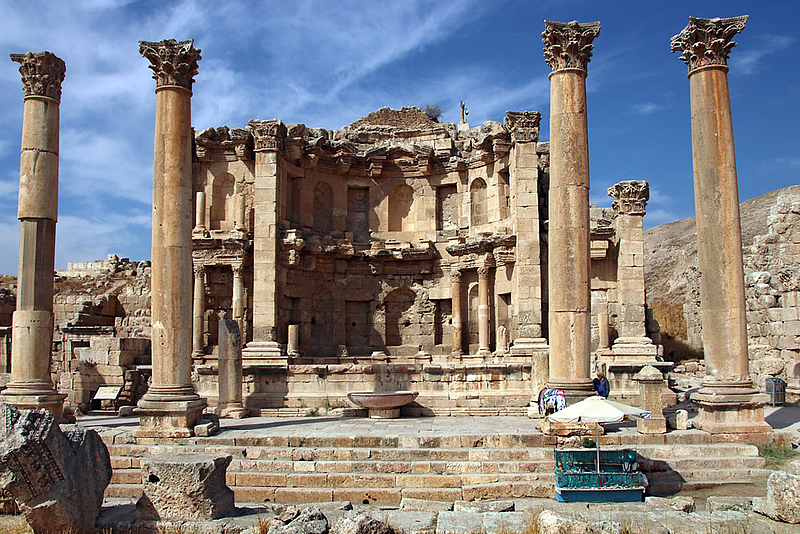 Around 125 AD Gerasa's water supply system was built, and by the end of the 2nd century the flow of the main aqueduct was increased to address a growing demand for water following the construction of the baths. This imposing Nymphaeum was then built around 190/191 AD to add a main source of water to the multiple small public fountains that had previously been built along the Cardo. The Nymphaeum is thus a monumental fountain that served the public's daily water needs. It sits along the main street and consisted of two side aisles which enclosed a central semi-circular apse that was topped with a concrete vault. The two levels of the facade were richly ornamented with carvings, panels, and Corinthian columns. The lower level was adorned with marble panels and the upper level decorated with painted stucco. Water spouted from the mouths of several carved lion heads into a large, deep basin that occupied the entire width of the monument. The water would run continuously, and any overflow was collected by the street's sewage system.